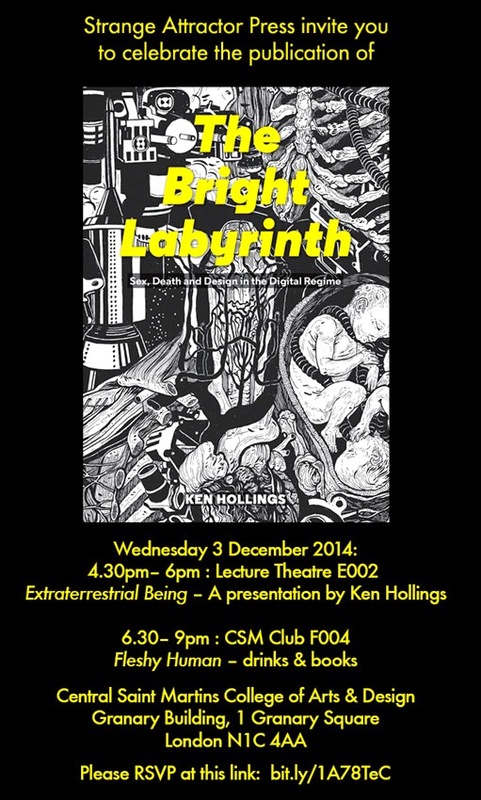 After almost a year waiting patiently for me to regain some strength following my recent treatment for cancer, Strange Attractor Press and Central Saint Martins School of Arts and Design are happy to announce that there will be a launch event to celebrate the publication of my latest book The Bright Labyrinth on December 3. Between 4.30 and 6.00 I will be giving a lecture, ‘Extraterrestrial Being’ on the relationship between design and writing as exemplified in the new book. Then from 6.30 until 9.00 there will be a party, a book signing and a short reading from The Bright Labyrinth. The location of these two separate parts can be found on the invite reproduced above. The whole celebration will be taking place at Central St Martins. If you wish to attend all or part of this, you must RSVP beforehand for security reasons. Please follow this link and either select either ‘Extra Terrestrial Being’ if you wish to attend both the lecture and the party, or ‘Fleshy Human’ if you can only make it along to the party. Or you can use the tiny url featured on the invite to make the same choice. It has been a long hard road trip to get here, so I hope you will be able to come along and celebrate with me. Enjoyed the lecture immensely looking forward to the postman delivering the book. Is there an explanation as to how to read it in the three ways as mentioned at 'extra terrestrial being'? Did you know you can create short links with AdFly and get $$$$ for every click on your short links.